Maybe you already post on Facebook three times a week. Maybe you already boost posts to promote your content. But are you missing out on a simple way to share your brand story using the visual web, on the most popular social media network in existence today? Tom’s Shoes was founded in March 2006. They hired their first employee in August 2006. His name was Jonathan and apparently he was really into mohawks. Later that year, the founder, Blake travelled to Argentina to give away the first 10,000 shoes to children who inspired him to start the company. Marking the beginning of the “Shoes for Tomorrow” project. In March of 2007, Blake pulled an Airstream trailer across America to promote TOMS One-For-One idea. If you never heard of TOMS shoes, now you have an idea of what they’re about. If you already knew them well, now you have some new stories to tell your friends. Someone at TOMS took some time to backfill their Facebook timeline with these (and other) tidbits, outlining the story of founding and growth of their brand. Leaving a few simple breadcrumbs for the fans and the curious to follow. Here’s how you can do the same for your organization. If you don’t already have a Facebook page, check out this guide to create one. Consider your target market. Who will be reading through these? For example, first time visitors to your Facebook page and/or someone who wants to find out more about your organization before they donate. Tell a good story. If you compare TOMS to Moleskine, one brand spins a better yarn then the other. Make sure your stories are as interesting and engaging as they can be. You can also consider hiring a copywriter to help you create a few blurbs. Show me more. 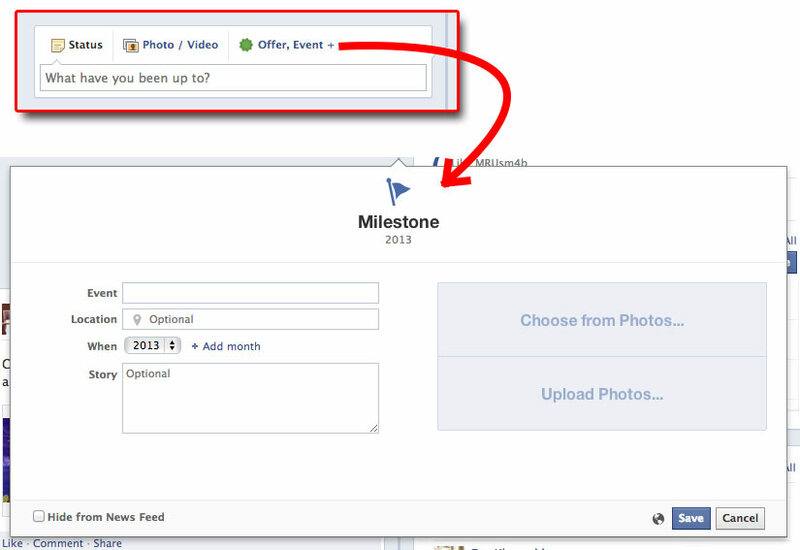 You have a limited amount of space for each milestone. Why not link to a blog post, video or a Flickr gallery that goes into much more detail. This creates an opportunity to engage the reader further and let them experience your brand through other touch points. Process the photos. You’ve heard about Visual Web – here’s your chance to stake your claim in that space. Put together some great, high quality photos for each of the milestones. TOMS edited their photos to suit brand milestones. What Brand Milestones Should You Create? Interestingly, it’s mostly big brands that have taken advantage of this idea. Have a look below for inspiration. Now you know how to use those same features for your organization :) And hey… if you found this helpful, I would really appreciate you sharing it on Twitter or Google+. How do you tell your organization’s story using Facebook? What a great idea Ernest. I’m glad you highlighted this for the rest of us. And you’re right, there is a big difference between the way those two brands (Moleskine and Tom’s) approached their Facebook pages. I already had predisposed opinions about the two brands (from an intent to purchase standpoint, I’m more likely to purchase a Moleskine notebook than a pair of Tom’s shoes). However, I will concede Tom’s does a much better job of ‘telling their story’ on their Facebook presence. It would be interesting to know how many people formulate a positive opinion of Tom’s shoes as a potential purchase choice due to the wonderful back-story available on Tom’s Facebook presence. Thanks again for writing about a good use of the Facebook timeline. I’m going to remember this for future use. Hi Earl – great to hear from you! As for how many people will form a positive opinion based on TOMS Facebook backstory, it’s hard to say. I’d say very few. Chances are, by the time they’re there, they have already heard the story and have an idea of what the company is all about. The backstory may move the needle when it comes to getting to know the roots of the company and the reason why they got started. And on that note, there is still room for improvement. For example, including links to blog posts that tell the entire story in detail. More engaged the reader is, better the chances they become a “brand ambassador” IMO.